Yesterday, I got to thinking about my past week. It had a little bit of everything in it. Then it occurred to me that much of what happened during it, all tied together in a way. I'll talk about that at the end of this post, but first, here's what my week brought me. Monday: After a full day of work, I went down to the Guest House of Milwaukee with my wife and another family. Guest House is a men's transitional housing and job placement facility in downtown Milwaukee. I hate to call it a homeless shelter, because it really is so much more than that. This is not just a bed and a meal, it's a program to get homeless, jobless men back into the workforce and living on their own. They help address addictions, mental health issues, abuse and other things. Because my wife and I are not experts in those areas, we help where we can. She does the lion's share of the work - planning and shopping for food and then preparing it, whereas I show up and help serve the men when I can. We serve monthly, but lately she has been doing it twice a month as part of our church, CollectiveMKE. I can't say enough about how blessed we are by the responses and gratefulness of the guys at the shelter. They thank us profusely and help us where they can. We do this because it's the right thing to do, and we're the ones who end up coming away blessed. Wednesday: The Waukesha Public Library hosted a presentation called The Hidden Impact of Racial Segregation in Waukesha County. It was presented by Reggie Jackson a teacher at Milwaukee Public Schools and head griot at the Black Holocaust Museum. His presentation, ideas and the statistics he brought to light were eye opening. I've always known Milwaukee was the most segregated city in the US, but what I learned was how it is as much a regional and even statewide issue as it is at the city level. The talk even mentioned housing covenants drawn up in the 30's that are still actively on the books (though not legally enforced) today. These covenants restricted housing ownership in certain subdivisions and neighborhoods to whites only. More eye opening were some of the steps our government took (and is still subtly taking) to red line areas and restrict where low income housing could be built. The whole thing was shocking and sad. And the part that I have the hardest time with is reconciling that I'm part of the problem. I moved to Waukesha in part to be closer to my job, but also because we had some criminal incidents near us (some racial, some not) when we lived on the East Side of Milwaukee. I might have been better served to stay and work toward better solutions than to just flee. But here I am. Now what can I do to make Waukesha a better place to live for all? Mr. Jackson ended the message with hope giving the audience ideas on where they can make a difference. It begins with acceptance, understanding and getting to know one another. He said something to the effect of, "We all bleed the same when we're cut." That kind of sums it up. 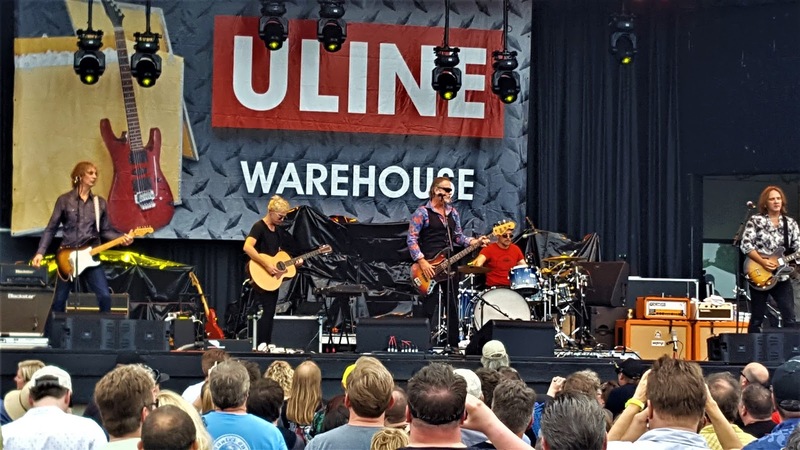 Thursday: I went down to Summerfest for the first time in over 20 years on Thursday, primarily to hear my favorite band, The Church. 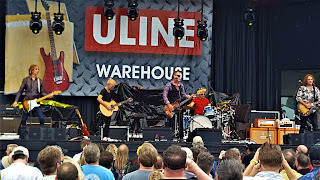 My wife and a friend of ours and I ended up seeing not only them, but some old bands from our past, The Suburbs (an 80's band from Minneapolis), Soul Asylum (also from Minneapolis), Tommy Tutone (of 867-5309 fame), a Smiths cover band and a couple of local acts. And it occurred to me how much I love the concert experience. It brings people together to share a common appreciation for a band. I have been to over 40 major concerts over the years and I've got a few more coming up yet this summer. And so thinking my week through, I couldn't help but tie all of these activities to what I like to call the hippie ideals. All of these behaviors, for me personally anyway, came out of growing up in the 60's and 70's. I was taught to care for those with less, to love ALL people - especially those not like us, and to work toward a better world by staying educated, engaged and involved to social justice issues. Even the concerts come out of the whole rock and roll awakenings of the 60's and 70's. Because as a generation that was born on Bob Dylan and Crosby Stills and Nash singing about change, action and revolution, we need to have fun too. And there's nothing better than live music to help with that. It brings people together and is the great equalizer. If you want to dance, black, white or brown, go for it. No judging here. So, while I don't pretend to have been a hippie - I was a little young for that - I saw enough of the protests and riots and unrest to have it affect my world view. And I had brothers, sister and a mother who instilled some of the core values of the generation in me. We're all people and we're in this thing together. While I don't feel like any one person can change the world, everyone can do a small part to change it and if we did, it'd be a much, much better place today. Because if we aren't living out what we learned during the dawning of the age of Aquarius, then we maybe never learned it in the first place. Below are some links to help you become more involved. Good 4th of July post Jim.